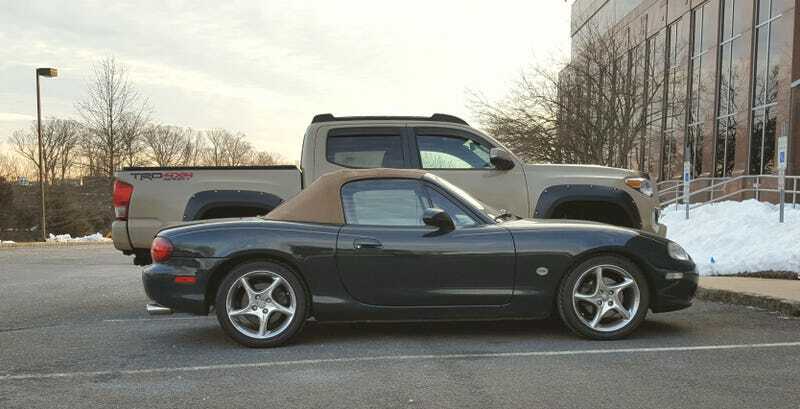 Most of the major work that needed to be done on the car has already been finished, including the 60,000-mile servicing and upgrading the worn out shocks and exhaust with some Flyin’ Miata pieces. A new top is not currently in the budget, so there’s really just a few little things that I wanted to take care of before the warm weather arrived. Specifically, I wanted to 1) fix the broken cup holder lids on the center console and 2) rebuild the shifter. More on that second one later. Like so many cars of this generation, the lids that cover the cup holders in the center console are broken. These lids are supposed to snap smartly into the open and closed positions by means of a spring. Over time, the plastic that holds this spring in place tends to bend and break and so the lids just flap up and down. This is a major annoyance as it’s very easy to hit this lid with your elbow when shifting, which causes it pop open and obstruct your elbow even more. That’s right, there’s not a lot of room in there, so your elbow will crash right into an open cup holder lit. To fix this, first you have to take out the center console. This is done by removing the two screws located under the plastic caps at the front of the console and also the two screws in the storage bin. If your car is equipped with power windows, you will also need to remove the power window switch. You can do this with a very thin metal paint scraper that is available from any hardware store. A word of caution here: years of direct sunlight may have made the plastic on this piece extremely brittle. I chipped mine taking it out, so be extremely careful when inserting the metal edge between the pieces. A second word of caution: It’s possible that the spring that is supposed to be attached to the cup holder may have completely separated from the assembly. In that case, it may not come out with the console. Rather, it may be left directly below the console piece or, as in my case, it may fall out onto the floor when you life out the console. I actually found it on the floor behind the driver’s seat. Keep and eye out when you remove the console. With the console out, the cup holders can be removed by unscrewing them from the bottom. These are easy to find and should come out with no trouble. Note that the cup holders actually overlap and that the two screws in the middle are used to attach both pieces to the console. When you put them back in, you will need to put in the rear-most cup holder in first and then put in the front-most unit. One end of the spring is supposed to be attached to the lid while the other is held in place on the cup holder by a small plastic tab. I can’t show you the tab because it broke off some time before I bought the car. To fix the floppy lid, the spring needs to be held in place so that is doesn’t slip off the cup holder. A thin enough screw will fit in the hole that is already on the cup holder without breaking the plastic. The washer should be wide enough to keep the loop on the spring from slipping off. And that’s all it takes to keep the lids closed when you want them to stay closed. While the center console is out, it’s worth doing some quick cleaning. Rinsing out the cup holders in the sink is a good idea as they may have accumulated years worth of dirt and spilled drinks. I also took advantage of the easy access to clean the shifter boot, which is easily removed by loosening four screws on the bottom. Once removed, it’s very easy to clean it with leather cleaner and reach all of the edges that you can’t quite get when cleaning it from the top. With these little detailing touches completed, all of the pieces simply screw back into the center console piece. Note that the screws and washers leave plenty of clearence so they fit back into the console without rubbing the inside. And that’s it: no more floppy lids; super clean shifter boot and cup holders. I’m sure the resale value of the car has now gone up ten-fold. While the console is out, I also plan to rebuild the shifter, but the details of that will little adventure will have to wait for another time.